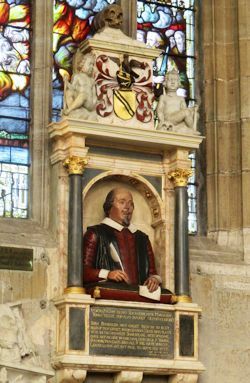 Shakespeare’s tomb memorial at Holy Trinity Church, Stratford. An illustration of Shakespeare’s original tomb memorial made in 1665. The man depicted is not a playwright but a dealer in bagged commodities. The historical facts concerning William Shakespeare’s life reveal many strange paradoxes. While the records from the theatrical world in London show that he was working as an actor and playwright, the records from his hometown of Stratford-upon-Avon show that he was simply a grain merchant. Nowhere in the contemporary records of Stratford-upon-Avon is there a single reference to Shakespeare being a dramatist or writer of any kind. No record exists of his receiving an education, buying a book or writing a single play. Even the monument besides his grave in Stratford’s Holy Trinity Church - the famous bust depicting the Bard composing his works - was an eighteenth-century fake. Such monuments were erected to honor a deceased person’s professional standing and, as such, depicted him holding something associated with his profession. The present bust shows Shakespeare as a writer with a quill and parchment. To the modern visitor it appears that Shakespeare was recognized as a playwright in Stratford at the time of his death. However, the church records reveal that this particular bust was not erected until 1748. It was commissioned by a theatrical manager named John Hall who wished to promote the tourist industry in the town. Fortunately, an illustration of the original monument still survives as an engraving in Sir William Dugdale’s Antiquities of Warwickshire published almost a century earlier in 1656. Here there is no quill or parchment: instead Shakespeare is shown with his hands on a sack. It seems he was being depicted as a dealer in bagged commodities - a grain merchant. 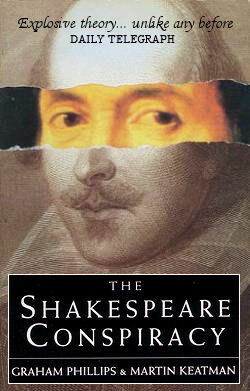 Many authors have speculated that these paradoxes imply that Shakespeare had not been the writer of the plays attributed to him. In The Shakespeare Conspiracy, Graham Phillips and Martin Keatman uncover evidence of another, more intriguing explanation. The documentary evidence shows that William Shakespeare was leading a deliberate double life - a wealthy grain merchant in Stratford; a struggling playwright in London. For instance, the land registers of Stratford for 1597 show that Shakespeare was rich enough to buy New Place, the second largest house in the town, while the records in London at the very same time show that was unable to pay the rent on a small apartment in the poorest district of Billingsgate. The following year when Shakespeare was listed in Stratford as possessing substantial grain holdings and lending a considerable sum of money, in London, court transcripts show that he had been forced into hiding by debt collectors who were pursuing him for less than a pound. What was the reason for this bizarre double life? Why is far less known about William Shakespeare than about other, less successful contemporary playwrights? What happened during the so-called Lost Years, a six-year period of his life when he simply disappeared? In The Shakespeare Conspiracy, Graham Phillips and Martin Keatman uncover startling new evidence of Shakespearean intrigue at the very highest level - schemes of conspiracy and counter-conspiracy involving Sir Walter Raleigh, the Elizabethan Secret Service and a plot to kill the queen. In this fascinating book the authors reveal a real-life story of Elizabethan espionage in which Shakespeare’s role as a double agent may ultimately have led to his murder. English editions: HB Century 1994, PB Arrow 1995.